Whether it’s cheddar or goat, blue or swiss, I love cheese and could eat endless amounts. The passion hasn’t led to much besides after dinner regret and a tweet published in the Milwaukee Magazine. I have dreamed of bigger and better things to have my name associated with, but I was thrilled nonetheless when my brother-in-law discovered the printed tweet. @KatieRiibe: First stop off the plane in Milwaukee – cheese curds. It’s going to be a good weekend. Knowing that, you can imagine my excitement when I stumbled upon thecake on the right. I couldn’t help but wonder if I made a huge mistake choosing my traditional wedding cake. It isn’t because it’s extravagant, but because it’s made entirely out of cheese. 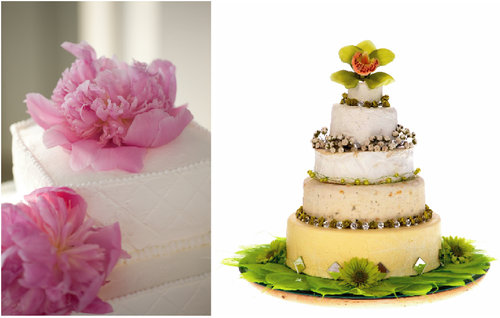 I had so much fun working with the Norwoods who made my delicious cake on the left, but I must admit I would choose cheese over chocolate any day of the week.